As you know, Ben Folds has reunited with his old bandmates Darren Jessee and Robert Sledge for a recording session, with the intention of releasing an album if things go well. Apparently, as you can see from the photo, things are going well – enough so, in fact, that not only is an album in the offing, but a tour as well. Dates and locations are being booked and firmed up, but expect to see an announcement shortly. They plan to continue recording into March, and then we’ll see what happens! Update: The official schedule isn’t out yet but already one festival is announcing booking the reunited trio. 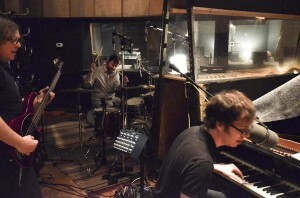 Mountain Jam 2012, held in Hunter, N.Y. May 31-June 3, is promoting Ben Folds Five as one of its many acts. Tickets are already on sale. This is the best news!! The chemisty with all 3 is much greater than Ben’s solo performances and material. Keep up the great work, Frank.